Easter is done a little differently in the Greek Orthodox community. Traditionally with a midnight service and lively festivities to celebrate the resurrection of Christ, it’s a highly anticipated holiday. We will, of course, be celebrating, and we can’t wait to see you at the party! Our special Greek Easter menu will include slow-cooked kid goat, Tsoureki bread and slow-cooked lamb. 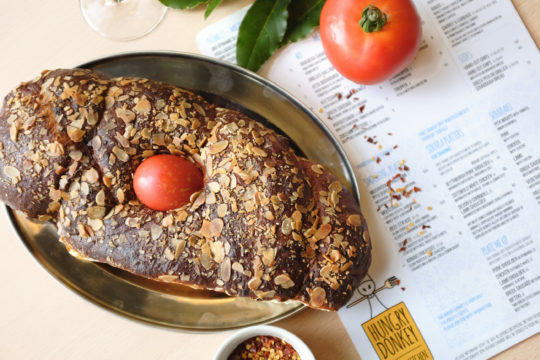 We’ll be serving these traditional Easter dishes all day on Sunday 28thApril, and we’re confident that our Greek Easter celebrations will be the best in all of London. It’s okay if you haven’t participated in Greek Easter before – there’s a first time for everything! Join us on the 28thApril to discover what Greek Easter is all about. It will be a little busier than usual, so we do suggest to plan ahead. Book with a call to 020 7392 9649 or an email to reservations@hungrydonkey.co.uk. We will see you there!